WHEN: August 13 & 20 at 3 p.m. and August 16 & 17 at 8 p.m.
TICKETS: $25 for students to $38 (premium adult). For online purchases, visit www.axelrodartscenter.com. The box office is open Monday through Friday from 10 am to 3 pm: 732-531-9106, ext 14. The Axelrod offers ample free onsite parking and is completely handicap accessible. 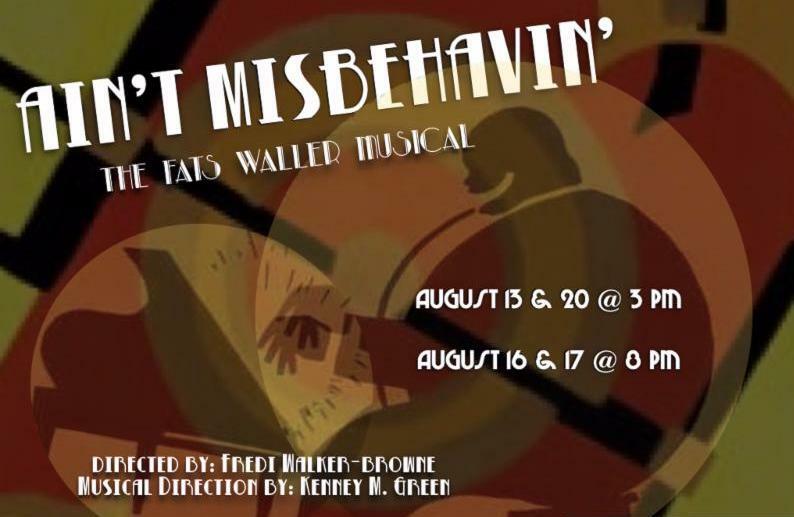 The winner of the 1978 Tony Award for Best Musical, Ain't Misbehavin' features the songs of Fats Waller based on an idea by director Richard Maltby, Jr. and Murray Horwitz. The original cast included Nell Carter (later of TV's "Gimme a Break"), Ken Page, André DeShields, Armelia McQueen and Charlaine Woodard. The original production ran on Broadway for nearly four years. Director Fredi Walker-Browne has been smitten by the show for decades: "I've loved Ain't Misbehavin' since I first saw it on Broadway in 1981. I was instantly struck by the wonderfully layered nature of Fats Waller's compositions in both a musical and cultural context. I was fortunate to sing the Armelia role earlier in my career and now I'm beyond delighted to be collaborating with outrageous talents like Musical Director Kenny M. Green and my assistant choreographer Obediah Wright on what I envision as a 21st century re-boot of this amazing show." Né Lasheé (who starred in APAC's production of "Dreamgirls" last year) returns as Nell. She is joined by a cast of New York professionals who have been in both national tours and regional productions around the country, including Larry Darnell Penn Whitfield as Ken, SAndra Ward as Armelia, Obediah Wright as Andre and Katelyn Bowman as Charlaine. Leading the band of horns and percussion onstage is New York professional cabaret pianist and vocalist Kenneth M. Green, who has performed in "Ain't Misbehavin'" and music directed the show about a dozen times regionally around the country. Musicians regard Thomas Wright ("Fats") Waller as one of the founders of jazz piano whose popular compositions have been recorded by countless artists over the decades. Set in the Harlem Renaissance in New York City, "Ain't Misbehavin'" includes favorite Waller standards such as "Honeysuckle Rose," "The Joint Is Jumpin'," "'T Ain't Nobody's Biz-Ness If I Do," "Squeeze Me," and of course the title song. The show also features songs that Waller made hits, including "I Can't Give You Anything But Love," "Mean to Me" and "Two Sleepy People." APAC's "Ain't Misbehavin'" is being produced by Andrew DePrisco and Jess Levy with lighting design by Todd Loyd, set design by Fred Sorrentino, sound design by Gerry Gironda, properties by Susan Bloir and costumes by Scaramouche Costumes of Chester, NJ.